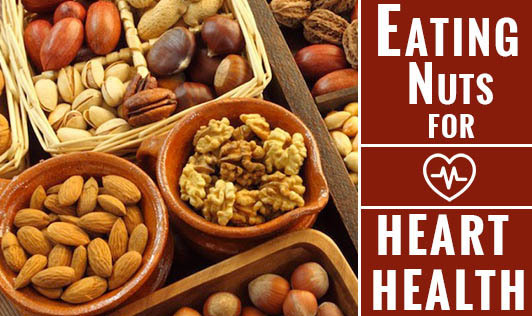 Eating nuts as part of a healthy diet can be good for your heart. Nuts, which contain unsaturated fatty acids and other nutrients, are a great snack food, too. They're inexpensive, easy to store and easy to pack when you're on the go. Instead of eating unhealthy saturated fats, try substituting a handful of nuts or a tablespoon or two of a nut spread. The American Heart Association recommends eating four servings of unsalted nuts a week. Select raw or dry-roasted nuts rather than those cooked in oil. Possibly. Most nuts appear to be generally healthy, though some more so than others. Walnuts are one of the best-studied nuts, and it's been shown they contain high amounts of omega-3 fatty acids. Almonds, macadamia nuts, hazelnuts and pecans are other nuts that appear to be quite heart healthy. And peanuts — which are technically not a nut, but a legume, like beans — seem to be relatively healthy. Nut oils are a good source of omega-3 fatty acids and vitamin E, but they lack the fiber found in whole nuts. Walnut oil is the highest in omega-3s. Nut oils contain saturated as well as unsaturated fats. Consider using nut oils in homemade salad dressing or in cooking. When cooking with nut oils, remember that they respond differently to heat than do vegetable oils. Nut oil, if overheated, can become bitter. Just like with nuts, use nut oil in moderation, as the oils are high in fat and calories.